The following are suggested thematic program descriptions for flute and piano recital. The booking of pianists varies depending upon availability. Karen Kevra performs regularly with a number of excellent concert pianists including Jeffrey Chappell, Alison Cerutti, Paul Orgel, and Jeewon Park. Ms. Kevra is also available for performance as soloist with orchestra. Requests for programs with mixed instrumentation (such as flute, cello, and piano trio, or flute and guitar duo) can be made on the contact page by leaving an e-mail message. All programs are available as a recital or recital with commentary. This personal and accessible all-French program, traces the lineage of the French flute repertoire from Baroque through modern works. This program emphasizes the connections between the compositions generated by the Paris Conservatory commissions, and the venerable father and son flutists Marcel and Louis Moyse. Michel Blavet, Sonata in G major "L'Henriette"
Audiences are intrigued by Variations for their accesibility and drama. This program includes Variations from light-hearted to emotionally intense. Costume changes optional. Franz Schubert, Introduction, Theme, and Variations on "Trockne Blümen"
Substantial Works in which flute and piano are equally matched. 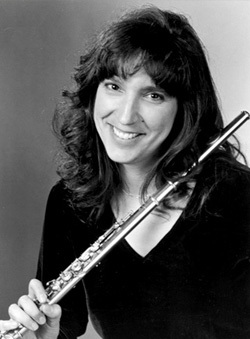 A program of the most significant pieces from the Romantic Flute Repertoire. Georges Bizet, Entr'acte of Act III from "Carmen"
This program features the best of American Works for flute and piano. © Karen Kevra 2018 - All rights reserved.